Kenneth Brent Olsen, Psy.D. is the current Region 4 Alternate on the Libertarian National Committee; Vice Chair of the Libertarian Party of California; and At-Large Representative of the Libertarian Party of Kings County. He is the former Chair of the Libertarian Party of Kings County and former California Team Leader for the Libertarian Party Mises Caucus. He was also the final holder of the Northern Vice Chair position for the Libertarian Party of California. He has been a member of the Libertarian Party since 1996, when he ran as a Libertarian for Salt Lake County Commissioner. He has a doctorate in clinical psychology from Alliant International University and is a practicing psychologist. He is one of the founders of Sequoia Psychotherapy Center. He also serves as Secretary for the non-profit, Heart of Hanford. He is a Goði and the Lawspeaker for the Vaknir Kinnish Commonwealth. He is the founder of Heathens 4 Liberty. He is one of the founders of the Beyond Imagination Gaming company. He is married to Jillian Olsen and is father to five children and two step-children. He also has two grandchildren. Kenneth Brent Olsen is a minarchist. A former Democrat and past liberal activist, he was drawn to the Libertarian Party by Harry Browne in 1996. While he has generally supported Libertarians since 1996, regardless of ideology, he has been an advocate of right-leaning Libertarians such as Bob Barr and Austin Petersen and has historically supported libertarian Republicans, such as Ron Paul, Rand Paul, and Justin Amash. He was a member of Austin Petersen's Freedom Ninja Army. 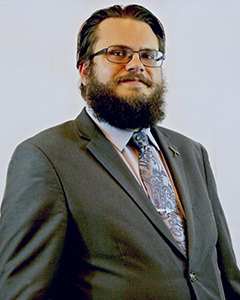 Kenneth Brent Olsen had been a state leader and organizer for the Mises Caucus in California and was a key mover in its efforts prior to the 2018 National Convention. He was also previously a member of the Radical Caucus and Libertarian Defense Caucus before disaffiliating with all caucuses on July 6, 2018, in order to focus on unity within the Libertarian Party. This page was last edited on 15 April 2019, at 18:58.